The Spring Migration is Here! Spring migrations are in full swing here in beautiful Panama City Beach. The water is warm and clean and baitfish schools have been stacking up nearshore around the buoys. On the beaches, plenty of pompano and redfish are being caught in the surf using sand fleas or shrimp-fished on the bottom. On the piers and just offshore, king mackerel are being caught regularly by anglers either free-lining live baits (sardines and cigar minnows) or trolling with plugs. Trolling live baits has been very productive as well. Cobia are also still being caught occasionally on the piers, as well as some really nice jacks and mackerel. Lots of fish are being caught in the pass, especially when we have big tides. Mangrove snapper and sheepshead are common catches when fishing shrimp on the bottom around the rocks. Spanish and king mackerel have been caught in the St. Andrews Pass on spoons, topwater baits and other artificial lures. Redfish have also been caught in the pass on shrimp, cut squid, baitfish chunks, live baits and an assortment of artificial lures including jigs and plugs. Meanwhile, lots of fish have made their way onto the many inshore grass flats surrounding our area. 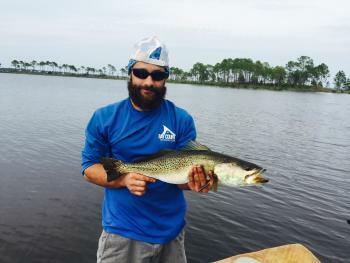 The most abundant at this point is the very popular speckled sea trout. They have been very plentiful in waters from 1-4 feet deep over mixed sand and grass bottom. Specks can be caught early in the morning on topwater walkers and poppers, and later in the day on jigs, shrimp imitations and subsurface twitch baits. Look for concentrations of fish located around areas of depth change, near small creeks and in potholes throughout the flats. Also on the flats – but closer to the shoreline – redfish schools cruise back and forth chasing schools of mullet or rooting around in the mud for shrimp and crabs. Weedless spoons and soft plastics are fantastic baits to throw at redfish when they are up in the shallows. Big bull reds have been very thick in the bays, around the bridges and in the pass. On incoming tides, the bottom machine often locates them feeding on schools of baitfish coming in from the gulf. I use heavy jigs or small jigging spoons when they are on this type of pattern. When the water is falling, they can often be found on the surface eating crab, eel and shrimp that are floating toward the gulf. If that’s the case, then D.O.A. shrimp, 5½” jerk shad or topwater baits cast up current and allowed to float back naturally are very effective and can yield lots of bites.